In this inspiring audiobook, Harvard-trained child and adult psychiatrist and expert in human motivation Dr. Shimi Kang provides a guide to the art and science of inspiring children to develop their own internal drive and a lifelong love of learning. Drawing on the latest neuroscience and behavioral research, Dr. Kang shows why pushy "tiger parents" and permissive "jellyfish parents" actually hinder self-motivation. She proposes a powerful new parenting model: the intelligent, joyful, playful, highly social dolphin. Dolphin parents focus on maintaining balance in their children's lives to gently yet authoritatively guide them toward lasting health, happiness, and success. As the medical director for Child and Youth Mental Health community programs in Vancouver, British Columbia, Dr. Kang has witnessed firsthand the consequences of parental pressure: anxiety disorders, high stress levels, suicides, and addictions. As the mother of three children and as the daughter of immigrant parents who struggled to give their children the "best" in life-Dr. Kang's mother could not read and her father taught her math while they drove around in his taxicab-Dr. Kang argues that often the simplest "benefits" we give our children are the most valuable. By trusting our deepest intuitions about what is best for our kids, we will in turn allow them to develop key dolphin traits to enable them to thrive in an increasingly complex world: adaptability, community-mindedness, creativity, and critical thinking. Life is a journey through ever-changing waters, and dolphin parents know that the most valuable help we can give our children is to assist them in developing their own inner compass. 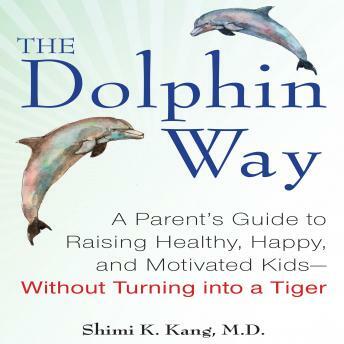 Combining irrefutable science with unforgettable real-life stories, The Dolphin Way walks listeners through Dr. Kang's four-part method for cultivating self-motivation. The audiobook makes a powerful case that we are not forced to choose between being permissive or controlling. The third option-the option that will prepare our kids for success in a future that will require adaptability-is the dolphin way. Valuable read for parents and everyone really. Love the shared perspective as a mother and clinician.